When Eliza Rich Merritt and General Edwin Atkins Merritt died in 1912 and 1916 respectively, Potsdam lost two very prominent, well-liked citizens. Long-time residents of the North Country, the Merritts had been socially active in their church and community. General Merritt had been politically active as well, holding a number of positions at the sate and federal level, including Collector of the Port of New York and, at the request of President Garfield, Consul-General to London. The Merritts shared a strong faith in the value of education and in the course of General Merritt’s career he served on the boards of SUNY-Potsdam (then the Potsdam Normal School), Clarkson, and St. Lawrence University. In 1928, 100 years after the birth of both Merritts, their daughter-in-law Edith Wilcox Merritt and granddaughter Esther Merritt Sisson donated a stained glass window to the Universalist Church n Potsdam. Known as “the Good Shepherd window”, the gift was a memorial to Edwin and Eliza Merritt, former members of that congregation. Six years later when the church disbanded, the building was given to the village for use as a public library. 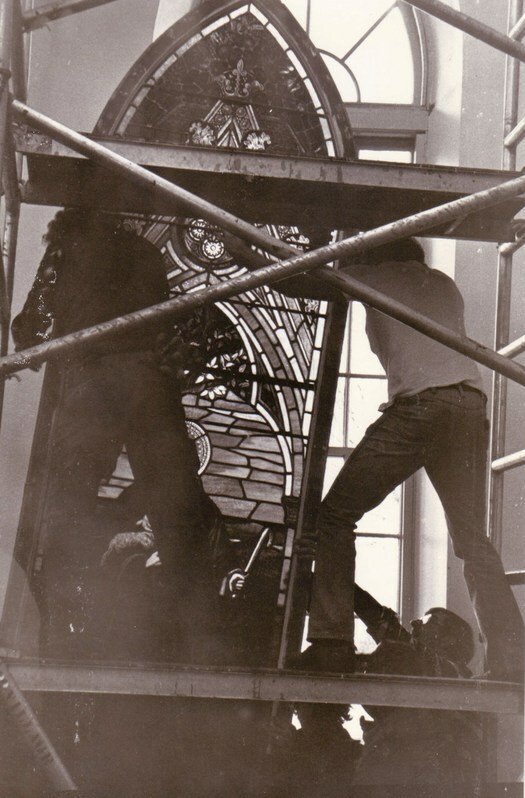 The window, offered to several local institutions for its historic value, was eventually removed and placed in temporary storage. The former church building changed hands a second time, in 1976, when it became the Potsdam Public Museum. The bicentennial inspired the Museum staff to research the history of its new location, triggering a search for the Merritt memorial window. It was believed to have been offered to the village, then the Normal School, and later Clarkson. The Museum staff’s numerous inquiries finally turned up a letter indicating the Clarkson had accepted the window, hoping to install it in one of the new buildings on the hill campus, thus honoring the former trustee and his wife. This news was encouraging, but only for a short time: the window itself still could not be found. Meanwhile, renovation of the Museum’s new quarters had been underway for almost 9 months. By September, 1977 the workers had finished cleaning the ceiling and renewing insulation, the scaffolding was about to be removed, and the carpet-layers were waiting to begin the next phase. If the window was to be restored to its original location without considerable expense, the time was now. Change came to the rescue: the Museum’s last effort, a plea for information printed in the local paper, resulted in a phone call from Eugene Patraw, a maintenance worker at Clarkson. He had discovered a large, dusty, and unwieldy crate in the basement of Holcroft House: could it be the window? It was. 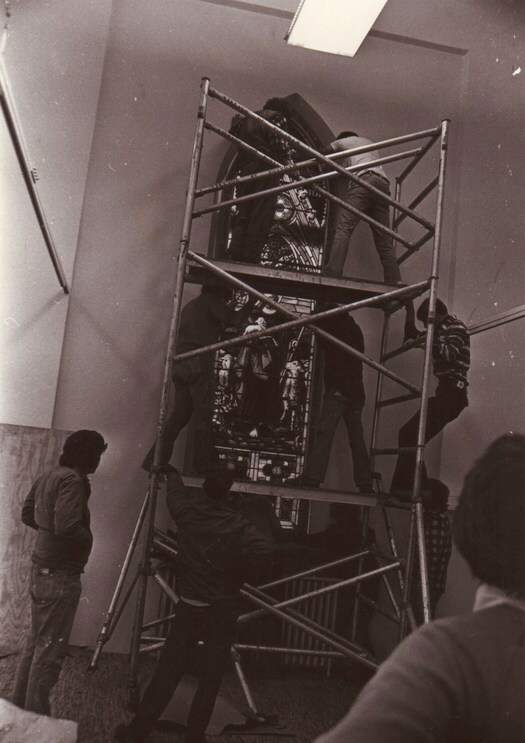 After securing permission from then Clarkson President Robert Plane, the Museum’s director, Kay Wyant, set about retrieving and installing the window. The “temporary” storage of 1935 had been extended to 43 years. No one knew how many times the window had been moved – and, fearful of damage, no one was eager to move it now. After some negotiation, Clarkson offered to take the crate out of Holcroft House and the village crew agreed to transport it to the Museum. Once there, the crate was the center of an apprehensive circle of people. The Museum staff opened it slowly, pulling packing material aside to reveal one section after another of intact glass. Tension turned to elation as it became apparent that except for one nickel-sized hole, the window was in perfect condition. Still pressed by the refurbishing schedule, Museum staff and volunteers worked around the clock with ammonia and toothbrushes to clean the window. The chore was gratifying, as bit by bit, the colored glass regained its original vibrancy. Under the direction of Leon Strader, a Clarkson employee, and skilled carpenter, the window was mounted on a frame and secured in place – a breathless event for those present since it proved surprisingly bendable, swaying forward and back as it was held aloft. In the midst of the general bustle, a stained glass artisan Kay Wyant had met at a local craft fair paid an unexpected visit to the Museum. With little difficulty and no fanfare he repaired the small hole in the window, charged the Museum $8, and left as abruptly as he’d come. 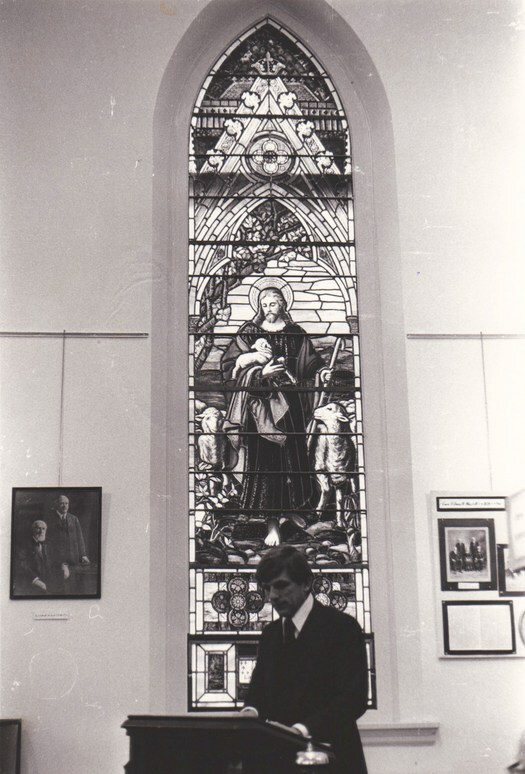 On January 22, 1978, some 80-90 people gathered at the Museum to rededicate the Merritt memorial window. Exactly 50 years had passed since the day and hour of the original dedication and a number of the people present knew this from experience. For then, and for those who had worked to find and restore the window, the ceremony had personal as well as historical significance. The window had come to represent the time and place in which the Merritts had lived and a revival of interest in the values that had won them community recognition. The shepherd was a familiar figure in the pastoral civilizations of biblical lands. Carrying little more than a cooked staff, he (or often she) guided and defended the flock, kept it together, and chastised the disobedient. It was the custom in biblical times to lead sheep rather than drive them. 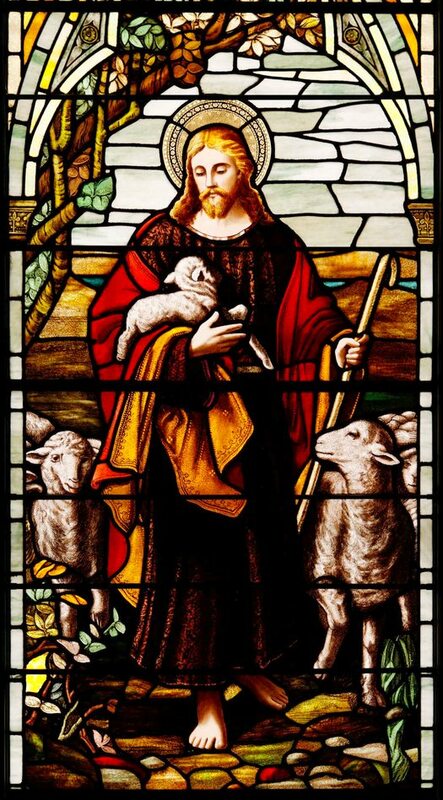 Thus the shepherd was an appropriate and frequent biblical metaphor for the Christ figure. The image may be particularly apt because the Shepard, inheritor of a nomadic tradition, embodied two seemingly oppositional roles: that of companion as well as leader. Christ was often depicted as strong, capable of protecting his followers, but also gentle with them, knowing their condition, adapting himself to their needs and bearing them in his arms. What man of you, having an hundred sheep, if he lose on of them, doth not leave the ninety and nine in the wilderness, and go after that which is lost until he find it? And when he hath found it, he layeth it on his shoulders rejoicing. And when he cometh home he calleth together his friends and neighbors, saying unto them, Rejoice with me; for I have found my sheep which was lost. I say unto you, that likewise joy shall be in heaven over one sinner that repenteth more than over ninety and nine just persons which need no repentance. It is interesting to not the Universalists of the 1800’s believed in Christ as a prophet, teacher, or revered figure, but not as an embodiment of God. The window was designed and produced by Harry James Horwood of Ogdensburg, New York. 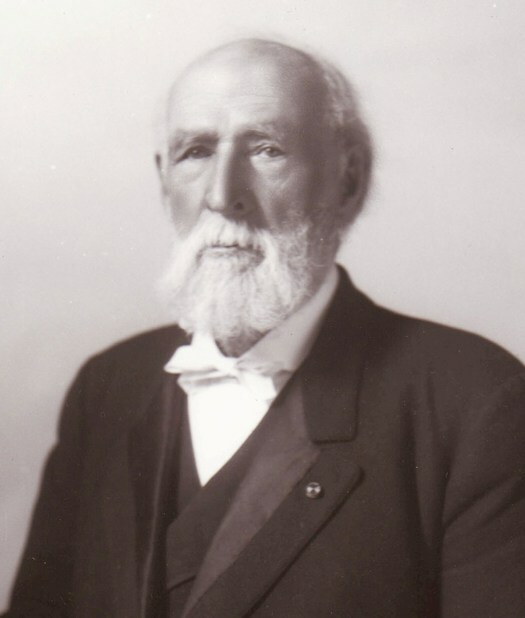 General Edwin Atkins Merritt was born in Sudbury, Vermont, in 1828. He moved to Pierrepont, New York, at 17, earning his living first as a teacher, then as a carpenter and surveyor for the Potsdam & Watertown Railroad. His election to Supervisor of Pierrepont in 1854 and his later role training troops during the Civil War proved to be the first steps in a varied political career that won him respect, titles, and friendships on a national scale. He distinguished himself in a number of State positions held by the appointments of President Lincoln, Hayes, and Garfield. The latter appointed him Consul-General to London, where he served until his retirement. Edwin Merritt married Eliza Rich of Canton in 1858. They had four sons. Their youngest, Edwin A. Merritt, Jr., grew up to establish himself as an important political figure in his own right. From his father he is said to have learned the art of listening courteously to another, then daring to follow his own judgment and sense of ethics. Affectionately dubbed Potsdam’s Grand Old Man, Edwin Merritt was a familiar sight and a frequent speaker at Potsdam Normal School events. He had been instrumental in establishing the Normal School (now SUNY-Potsdam) in the village and was president of the board of trustees there and at St. Lawrence University. He also served as trustee to Clarkson from its inception. Of his many professional roles, he was proudest of his efforts to promote higher education in his community and was steadfast in his belief that schools are “among the great forces that are permanently to benefit mankind”. Eliza Rich Merritt was born in Canton, New York, in 1828. 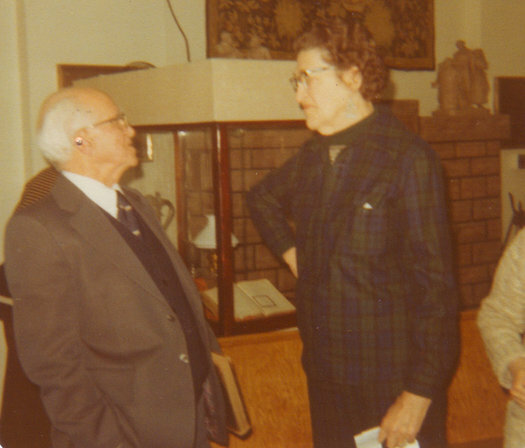 Testimonies of her character offer glimpses of a reserved intellectual whose vigorous interest in domestic, political, and moral questions earned her the respect and admiration of her community. 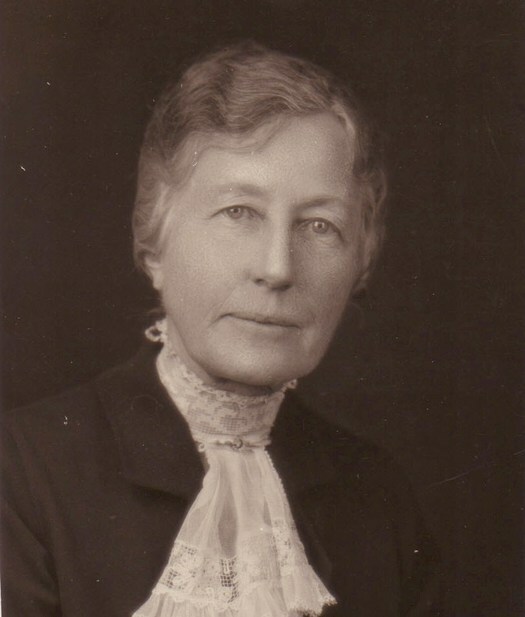 At the dedication of the Merritt memorial window, Dr. John Murray Atwood, dean of St. Lawrence University’s theological school and a lifelong friend of the Merritts, described Eliza Merritt as “a wise and capable woman ... a true companion and valued counselor for her husband”. She was strongly supportive of her husband’s professional endeavors and, since the two shared many intellectual interests, she was an able contributor to his career. For Esther Merritt Sisson, the Merritt’s granddaughter, Eliza Merritt’s unflagging interest in the world of ideas lent considerable strength to her marriage. She remembered hearing her grandparents talking together far into the night. When she grew older, that memory sparked admiration: after some 50 years of marriage, they were still engage in impassioned discussion.